I am working on a new book which was published in the USA about Scots influence on Civilization. I have regularly remarked on how religion was important to Scots and I read with interest this section from one of the chapters which shows the huge impact one Scot had on the USA. 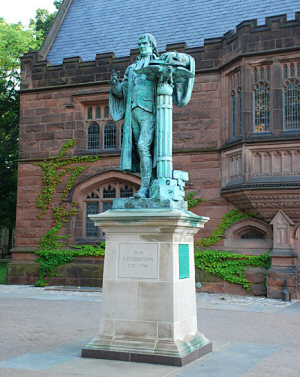 The picture below is his statue at Princeton. One illustrious example of patriotic devotion will ever stand in the historic annals of our country to tell coming generations of the service rendered to her cause. It is that of the venerable Dr. John Witherspoon. If Scotland had done nothing more than contribute this eminent scholar, teacher, statesman, patriot and divine to the young and suffering country at the most important crisis of its destiny, Scotland had thereby done enough to entitle herself to the nation's grateful remembrance for all time to come. Among all the great men with whom he stood associated during an eventful and hazardous war, and with whom he acted, when the war was over, in laying the foundations of our free institutions, there were but few who filled a more essential and important place than did Dr. Witherspoon. He had won a high distinction in his native land, both as a preacher and as a writer, when he was called to America in 1768, at the age of forty-six, to fill the presidency of Princeton College, New Jersey. The services he rendered to the college, both as an administrator of its affairs and as a practical instructor, were of the highest order. The institution at once entered upon a new and enlarged sphere of usefulness. He also, during the whole of this presidency, sustained the office of pastor to the Princeton Presbyterian church, preaching regularly twice on the Sabbath. When the crisis of the struggle for national independence came, he threw his whole influence, as a man and as a minister of God, on the side of the country, preaching and writing in its defence. In 1776 he was elected a member of the provincial Congress of New Jersey, and then of the Continental Congress at Philadelphia. Soon after taking his seat in the latter body he put his signature to the Declaration of Independence, for which measure his mind had been previously fully made up. The memorable occasion, with its far-reaching results, has been portrayed in glowing and impressive terms by Dr. John M. Krebs, as related in an interesting volume by Dr. W. P. Breed: "When the Declaration of Independence was under debate in the Continental Congress, doubts and forebodings were whispered through the hall. The Houses hesitated, wavered, and for a while the liberty and slavery of the nation appeared to hang in an even scale. It was then an aged patriarch arose, a venerable and stately form, his head white with the frost of years. Every eye went to him with the quickness of thought, and remained with the fixedness of the polar star. He cast on the assembly a look of inexpressible interest and unconquerable determination, while on his visage the hue of age was lost in the flush of a burning patriotism that fired his cheek. `There is,' said he, 'a tide in the affairs of men, a nick of time. We perceive it now before us. To hesitate is to consent to our own slavery. That noble instrument upon your table, which ensures immortality to its author, should be subscribed this very morning by every pen in the house. He that will not respond to its accents and strain every nerve to carry into effect its provisions is unworthy the name of freeman. For my own part, of property I have some—of reputation, more. That reputation is staked, that property pledged, on the issue of this contest. And, although these gray hairs must soon descend into the sepulchre, I would infinitely rather they should descend there by the hand of the executioner than desert at this crisis the sacred cause of my country.' Who was it that uttered this memorable speech, potent in turning the scales of the nation's destiny and worthy to be preserved in the same imperishable record in which is registered the not more eloquent speech ascribed to John Adams on the same sublime occasion? It was John Witherspoon, at that day the most distinguished Presbyterian minister west of the Atlantic Ocean, the father of the Presbyterian Church in the United States." These brief but weighty words, pregnant with the vitality of a young nation just struggling into existence, though uttered by one who had scarcely been a decade in the country, yet expressed the prevailing sentiment of the whole Presbyterian population of the land. To a man the Presbyterians of every colony were for the Declaration. Through the momentous struggle the Presbyterian Church re-echoed the ardent, determined, patriotic and uncompromising sentiments of that venerated and noble leader Dr. Witherspoon. He served in this high capacity for six consecutive sessions—from 1776 to 1782—and acted a most important part not only on the floor in public debate, but on many of the most important committees. Many of the important state papers were from his pen, and some of the most prominent measures adopted by Congress had their origin with him. Says Dr. Sprague, "Neither his courage nor his confidence ever faltered in the darkest day, being sustained not only by a naturally heroic spirit, but by an undoubting conviction of the rectitude of his country's cause. During the whole period in which he was occupied in civil life he never laid aside his ministerial character, but always appeared in every relation as became an ambassador of God. The calls for the observance of days of fasting and prayer were commonly, if not always, written by him. He preached always on the Sabbath whenever opportunity offered, and when for a short period he visited his church and family at Princeton." Besides his great services to the nation, this eminent man was called to act a leading part during the formation period—from 1785 to 1788—when the Presbyterian Church of the country was reorganized under a General Assembly and the present standards of doctrine and polity were revised and adopted. The committee selected from our most distinguished Presbyterian fathers and entrusted with this business were Drs. Witherspoon, John Rodgers, John Woodhull, Robert Smith, Samuel Stanhope Smith, James Latta, George Duffield, Patrick Alison, Robert Cooper and Matthew Wilson. When the first General Assembly under the new organization met, in Philadelphia, in 1789—the year of the first meeting of our National Congress under the new Constitution—Dr. Witherspoon preached the opening sermon and presided until the first moderator of the body, Dr. Rodgers, was chosen. Since then we have had an unbroken succession of Assemblies and moderators every year to the present time; the Church has spread across the continent; several new organizations, with their annual Assemblies and moderators, have been formed; the oldest division of it---that under the Northern Assembly—has swelled to 24 synods, 190 presbyteries, 5516 ministers and licentiates, 19,968 ruling elders, 6287 deacons, 5973 churches and more than 615,000 communicants. To this vast development in a single line of our Presbyterian succession no one man, probably, of all the great men of a hundred years ago, contributed more than Dr. Witherspoon. And what is true of our Northern division of the Church is equally true of the Southern Presbyterian Church, and to some extent also of all the other branches of the Presbyterian family claiming descent from the mother-churches of Scotland and the North of Ireland. The population of the United States now represented by all the branches of our Presbyterian family in the land would number several millions of people, and those amongst our most intelligent and influential classes. And who can estimate the value of the influence of these educated classes upon the life and character of the nation? We’re very excited to announce that a new weekly series has just started on Scotland on TV. ‘Conquer the Castle’ was filmed at Blair Castle and the Atholl Estates in picturesque Perthshire and features six ‘townies’ who will be competing to be crowned the ‘King’ or ‘Queen’ of the Castle. In each episode, the six contestants, who hail from cities across Britain and have very little experience of even visiting the countryside, will go head to head in countryside challenges which will test their rural skills. Tasks awaiting the competitors vary from rabbit-catching, nature rambles and gardening to a public performance with the Atholl Highlanders at Blair Castle, stag hunting, sheep-shearing and competing in the Braemar Highland Games. And check back to Scotland on TV each week for the next eleven weeks to see how they adjust to Scottish country life - as well as for fantastic views of scenic Perthshire. Well – that will teach me. I thought that I could take a short five-day break away from Scotland without missing too much. So what do I find on my return? Scottish Labour leader Wendy Alexander’s husband launches a broadside against London Labour’s increase in whisky duty. One poll shows a dramatic increase in support for the idea of independence – neck and neck with the status quo. And a second poll then shows independence in the lead. London Times headline: Brown hits new low as voters desert Labour. Labour MPs revolt over axeing of 10p tax band. Scottish Daily Mail headline: Honeymoon goes on for Salmond. Daily Mail article: Brown could face revolt if local polls ago against Labour. And all that is just for starters! We do indeed live in exciting times. In Peter's cultural section we get One battle which continues to haunt the Scottish soul after 260 years is the Hanoverian defeat of the Jacobites at Drummossie Moor on 16 April 1746. This was not a straight-forward battle between Scotland and England but a civil war between relations – the ruling Hanoverians on one side and the deposed Stewarts on the other. The Jacobite Cause and their demise at the Battle of Culloden has been romanticised over the years – the Bonnie Prince as against his Butcher cousin Cumberland has produced countless arguments and books. The Highlands, in particular, paid a terrible price for ‘The Year of the Prince’. Thousands of visitors from all over the world take time every year to visit the site of the battle which is looked after by the National Trust for Scotland. The numbers alone would have merited a new visitor centre but recent archaeological and historical research carried out by the Trust revealed that the now - previous visitor centre stood on the third Hanoverian line. As the Trust is determined to restore the battlefield to as close as it was on that fateful day 260 years ago, a new centre was the answer. In one of the largest projects carried out by the Trust some £9 million was spent on building a new visitor and exhibition centre which was opened to the public on 20 December 2007, a few months later than planned but just before the end of the 2007 Highland Year of Culture. The official opening by Scott Hay, aged 11, and six-year-old Philip Nicol, whose forebears fought in the battle, was carried out on 16 April 2008, the 260th anniversary of the battle. Prior to the official opening a piper played for one hour – the time the battle lasted. The new centre has already proved to be very popular and the Trust have strived to allow the whole Culloden story to be told, shorn of any romantic notions, in an innovative and interactive way to appeal to visitors of all ages. At the end of the battle, it is said that Lord Elcho shouted at the defeated Prince Charles as he left the field – “Run you damn’d Italian coward” reminding us that the ill-fated Prince was born in Rome. In memory of the Prince’s birthplace this week’s recipe is an Italian one which has become very popular in Scotland. Ingredients: 2 tbsp olive oil or sun-dried tomato oil from the jar; 6 rashers of smoked streaky bacon, chopped; 2 large onions, chopped; 3 garlic cloves, crushed; 1kg/2¼lb lean minced beef; 2 large glasses of red wine; 2x400g cans chopped tomatoes; 1x290g jar antipasti marinated mushrooms, drained ; 2 fresh or dried bay leaves, 1 tsp dried oregano or a small handful of fresh leaves, chopped; 1 tsp dried thyme or a small handful of fresh leaves, chopped; drizzle balsamic vinegar; 12-14 sun-dried tomato halves, in oil; salt and freshly ground black pepper; a good handful of fresh basil leaves, torn into small pieces; 800g-1kg/1¾-2¼lb dried spaghetti; lots of freshly grated parmesan cheese, to serve. 1. Heat the oil in a large, heavy-based saucepan and fry the bacon until golden over a medium heat. Add the onions and garlic, frying until softened. Increase the heat and add the minced beef. Fry it until it has browned, breaking down any chunks of meat with a wooden spoon. Pour in the wine and boil until it has reduced in volume by about a third. Reduce the temperature and stir in the tomatoes, drained mushrooms, bay leaves, oregano, thyme and balsamic vinegar. 2. Either blitz the sun-dried tomatoes in a small blender with a little of the oil to loosen, or just finely chop before adding to the pan. Season well with salt and pepper. Cover with a lid and simmer the Bolognese sauce over a gentle heat for 1-1½ hours until it's rich and thickened, stirring occasionally. At the end of the cooking time, stir in the basil and add any extra seasoning if necessary. 3. Remove from the heat to 'settle' while you cook the spaghetti in plenty of boiling salted water (for the time stated on the packet). Drain and divide between warmed plates. Scatter a little parmesan over the spaghetti before adding a good ladleful of the Bolognese sauce, finishing with a scattering of more cheese and a twist of black pepper. Christina McKelvie MSP's weekly diary is not available at this time. We continue to get more articles up and I'd encourage you to add some yourself. While we are a Scottish site this article service is not designed to be just for Scottish information. You can even discuss the Presidential race if you wish. The purpose of adding this service was to let people add their own information to the site without needing to submit it for us to put up. The service is fully indexed on our site and on various search engines. Donna has been adding some regular articles and others have added some interesting recipes. You can also add book reviews, interesting information on Highland Games and even add some old family history. Press releases can also be added and so if your company is doing something of interest then tell us about it. Should you be part of a society or organisation then make up an article and submit it to the site. In the event you can't find a suitable category or sub category then feel free to suggest one to us and we'll certainly look at adding this to the service. Remember also that when you submit articles you can add a url to all the articles you've submitted either on a web page or in an email. Name.—In old registers the name is uniformly written Kincarden O'Neal. Kincarden is said to be derived from Gaelic words signifying "the head of the hill." The village of Kincardine O'-Niel, in which the church and manse stand, is situated in a valley at the south-west comer of a hill of considerable height, named Ordfundlie. A rivulet, named Neal or Niel, running by the village, gives, it is supposed, the addition of O'Niel to Kincardine. Extent, &c.—The average length of the parish from south to north is seven miles, and the breadth from east to west five. The form resembles that of a parallelogram, with some projections and indentations in its sides. As the extreme length in some places is fully eight miles, and the breadth above five, the area is probably about thirty-five square miles. On the west, the parish is bounded by those of Aboyne and Lumphanan; on the north, by the parishes of Tough and Cluny; on the east, by Midmar and Banchory-Ternan; and by the river Dee on the south, which, in its windings, divides it from the parish of Birse and part of Aboyne. This parish may be said to be divided into three great straths or portions, by hills of considerable extent and height; one of which, the hill of Learney, may not improperly be regarded as a continuation of the hill of Fare. It runs in a circuitous direction north-west by west, cutting off a considerable portion from the other two divisions of the parish. The hill of Fare, which intervenes betwixt Midmar and Banchory-Ternan parishes, forms a part of the east boundary of this parish. It furnishes good peats to the tenants around its base,—the circumference of which is reckoned fourteen miles. It is in height nearly 1600 feet above the level of the sea, and is a landmark to ships on the east coast near Aberdeen. The other hills in the parish are cultivated or wooded to the tops. Ordfundlie divides the south from the mid, dle or centre division of the parish. The level ground in these two divisions is betwixt 400 and 500 feet above the level of the sea; the northern division of the parish a degree higher. Some years ago, there used to be pointed out, upon the streets of Glasgow, a man whose intellect had been unsettled upon a very strange account. When a youth, he had happened to pass a lady on a crowded throughfare—a lady whose extreme beauty, though dimmed by the intervention of a veil, and seen but for a moment, made an indelible impression upon his mind. This lovely vision shot rapidly past him, and was in an instant lost amidst the commonplace crowd through which it moved. He was so confounded by the tumult of his feelings, that he could not pursue, or even attempt to see it again. Yet he never afterwards forgot it. With a mind full of distracting thoughts, and a heart filled alternately with gushes of pleasure and of pain, the man slowly left the spot where he had remained for some minutes as it were thunderstruck. He soon after, without being aware of what he wished, or what he was doing, found himself again at the place. He came to the very spot where he had stood when the lady passed, mused for some time about it, went to a little distance, and then came up as he had come when he met the exquisite subject of his reverie - unconsciously deluding himself with the idea that this might recall her to the spot. She came not; he felt disappointed. He tried again; still she abstained from passing. He continued to traverse the place till the evening, when the street became deserted. By-and-by, he was left altogether alone. He then saw that all his fond efforts were vain, and he left the silent, lonely street at midnight, with a soul as desolate as that gloomy terrace. During the great fire, which nearly destroyed Konigsberg in the year 1764, a pastor of that city, ninety years old, lost his church, his house, his valuable library, and all his wordly goods. One of his grandsons rescued him from the flames, carrying him on his shoulders. When asked afterwards, by a village pastor who visited him, to tell him the result of his long and varied experience, he replied, "I have just been meditating on the 91st Psalm. I have experienced that every statement it contains is true, every promise sure. I lived in times of pestilence; I dwelt in the secret place of the Most High, and abode under the shadow of the Almighty. I have lived in times of war and bloodshed; He covered me with his feathers, His faithfulness was my shield and buckler. I was in danger by fire; He gave his angels charge over me to bear me up in their hands. He has honoured and satisfied me with long life. There remains now only one promise unfulfilled, and for this I am now waiting: ' I will show him my salvation!'" I have added a few more pages to the B's and started on the C's. 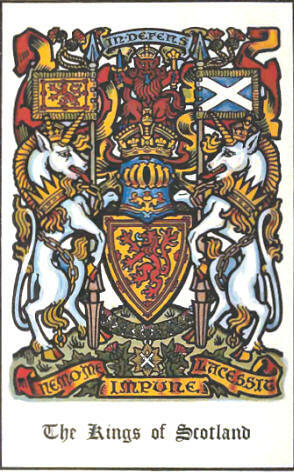 Founded on Wood's Edition of Sir Robert Douglas's Peerage of Scotland, containing an Historical and Genealogical Account of the Nobility of that Kingdom, Edited by Sir James Balfour Paul, Lord Lyon King of Arms with Armorial Illustrations. This is a 9 volume publication and I've added the preface and an index of the 9 volumes so you can decide which volume to download should you just be interested in a particular name. The first task of Scottish emigrants to the New World was to acquire a home and means of livelihood. As soon as it was accomplished, many of them, accustomed to years of struggle for economic and political freedom in their own land, began to turn their attention to public affairs. Politically articulate Scots made their appearance in the British colonies which are today Canada towards the end of the eighteenth century. In 1789, James Glenie, a brilliant St. Andrew's graduate recently turned lumberman in New Brunswick, was elected to the Colonial Assembly. There he rapidly came to the front by his fearless attacks on what he called the "Governor's pitiful Junto" for their system of land granting, their policy in military matters, their favouritism toward the Anglican Church, and their obstruction of measures passed by the Assembly. He lost support, however, when he went so far as to attempt a vote of censure of the governor, and the popular movement which he had begun collapsed for want of a leader when he left New Brunswick. Glenie was far from being the "violent Democrat and Jacobin" that the government had labelled him. He and his supporters had been motivated less by principle than by envy of the power and patronage of office. Yet they had made some claims concerning the constitutional rights of an assembly which were forerunners of the Reformers' claims of the next century. In the politics of Quebec in the same period, a Scot from Edinburgh, Dr. Adam Mabane, was prominent on the side opposing reform. After arriving in 1760 in the lowly position of surgeon's mate in the army, he had risen steadily in his profession, and in 1764 Governor James Murray had made him a councillor and a judge in the Court of Common Pleas. "Possessing marked ability, a strong character, and a warm Scottish heart," Mabane was one of the individuals with the most weight in the administration from these first civil appointments until his death in 1792. With his natural sympathy for the French Canadians, and his suspicion of the British merchants in Montreal and Quebec whom he regarded as republican innovators, he was the favoured adviser not only of Murray but also eventually of the next governor, Guy Carleton, and of his successor, Frederick Haldimand, who both believed in conciliating the French. Mabane left a dual imprint on Canadian politics. He was a reactionary who opposed immigration into Quebec and supported the old system, including seigneurialism. His warnings of the dangers in American democracy and of the need for resistance to political change were echoed in later Toryism. At the same time, as the chief builder of the "French party," Mabane expressed the vague hopes of French-Canadian nationalism which were given substance by the French-speaking reformers in the Assembly after 1791. Thus "the two parties to the constitutional struggle of the nineteenth century shared the political heritage of this half-forgotten leader." This week have added Chapters 6, 7 and 8. About the various phases of the intellectual life of Scotland much has been written, but so far as I know there has been no attempt to deal with the subject as a connected whole. In regard to the scientific side of the national development, I have been greatly indebted to the Principal of Edinburgh University, Sir William Turner, who in his recent address to the Royal Society of Edinburgh sketched in masterly manner the rise and progress of scientific study in Scotland. This department of the national life has been somewhat overshadowed by our theological and ecclesiastical controversies; and, judging from Sir William Turner's illuminating survey, an entire volume is needed to do justice to the subject. In my book I have not aimed at exhaustive-ness of treatment; the aim has been the more modest one of noting the salient points in the evolutionary process, and my reward will be great if the reader is sent to study in detail the subjects with which the volume deals. Much of the material has appeared in various public prints, the Glasgow Herald, T. P.'s Weekly and the late Scottish Review, the editors of which I cordially thank for their permission to reproduce the articles. In dealing with a nation's Intellectual Development the historian has two courses open to him. As the present writer has elsewhere remarked, an historical student may content himself with splitting his subject into sections and dealing with each section in the spirit of a narrator pure and simple. On the other hand, he may essay the more difficult task of seizing the dynamic principle of intellectual development and tracing its working through the various sections of thought and life. The value of the latter method, if successfully applied, is that history, instead of being a chaos of unrelated facts, is seen to be an intelligible and luminous evolution. We discover the relations which exist between the various factors in a nation's history: theology, philosophy, science, literature, by means of the dynamic principle, are seen to be bound together in organic unity. What, then, is the dynamic principle of historical evolution? In the opening chapter of the present writer's Century of Intellectual Development an answer was given to this important question—an answer which as being applicable to the subject under consideration may fitly be reproduced: "Taking a large view of history it will be found that man's intellect is mainly occupied upon three great problems—God, the universe, and man as an individual and a social being. The controlling factor in the process is man's conception of the Unseen Power upon which all things rest, and of which nature and man are manifestations. If we conceive of the Unseen Power as a supernatural Being, who by revelations has made known his will to man, then philosophy, science and literature will be moulded by, and permeated with, that conception. Even the social order will feel its powerful influence. Society will be framed on theocratic lines on the principle of authority." There comes a time when the principle of authority—valuable at a certain stage in civilization—weighs heavily on the social order, and by stereotyping ideas and institutions results in intellectual and social stagnation. In the sixteenth century, under the sway of Romanism, the intellectual and social life of Europe suffered what may be termed arrested development. In the interest of humanity it was necessary that the barriers to progress should be thrown down. The great liberating movement which changed the current of European thought and activity is known in history as the Reformation. 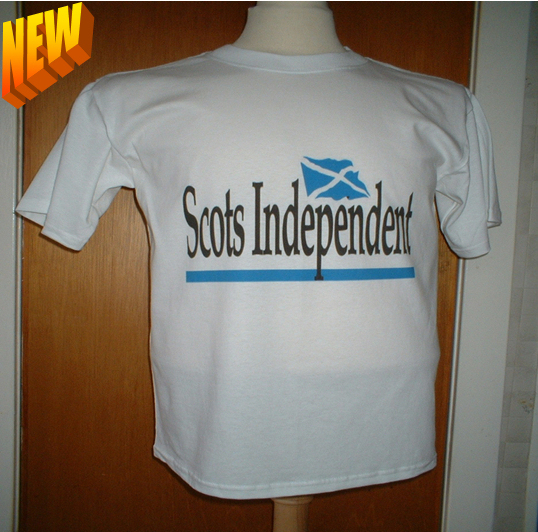 From it we date the beginning of Scotland's intellectual evolution. Augustin Fraser is a name not easily forgotten. During the World Scottish Festival, held in conjunction with the 350th anniversary of Montreal in 1992, a visitor to the Clan Fraser/Fraser Highlanders tent at Ile Ste-Hélène produced a pedigree chart tracing her ancestry to the Fraser Highlander who, she told us, had fought at Québec in 1759 and married a French woman when the regiment was disbanded in 1763. Since then we have collected a mountain of information on the 78th Fraser Highlanders and Augustin Fraser, but his name cannot be found in the muster rolls.